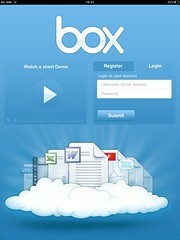 Following its hugely successful 50gb giveaway, Box.net is an attractive platform with which to integrate mobile apps. The Box.net mobile API augments its base API to provide additional resources to mobile developers. However, compared to the recently released Dropbox API, this toolkit seems to be lacking in some security and usability features. Guess an update is round the corner. Get sample code at Box Platform Developer Documentation / ApiExamples. Read more at Box Platform Developer Documentation / BoxPlatformMobile.